After the Durian Cake I did for my dad on Sunday, I made a Mango Mousse Cake for my fil, but with a twist. I used a chocolate sponge in place of the plain sponge and I also did a matcha wall, my first attempt at such a cake. 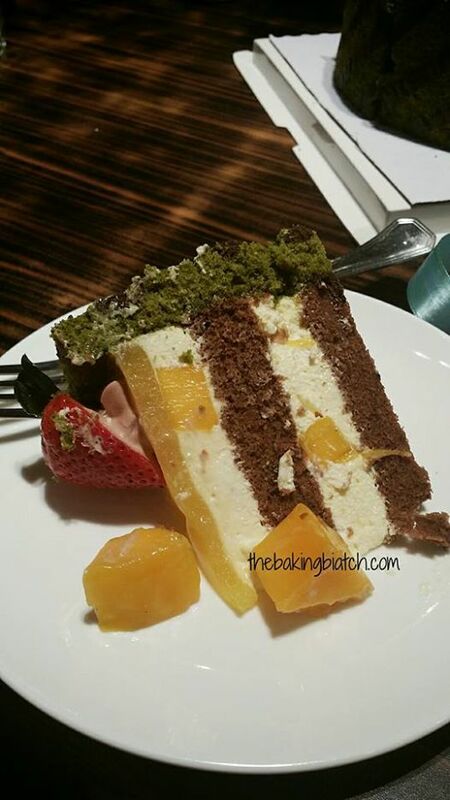 The matcha wall is a swiss roll made of sponge cake and I had a simple design piped for it.. It was pretty tricky working on it but I love every bit of it. This cake is tricky and I'd rate it a difficulty level 4 out of 5.. It took about 3 hours all in all to complete. 2. Allow cake to cool completely. 3. Slice into 2 layers/slices. 6. Scoop a ladle-ful of batter into a mixing bowl and sift in cocoa powder. Fold till well combined. Pipe diagonal lines on baking paper before adding in matcha mixture. 8. Bake for 10 - 15 minutes or till toothpick comes out clean when poked into the cake. 9. Remove from baking pan immediately and peel sides baking paper from the side ONLY. 10. Set aside to cool for 15 minutes. 12. Whisk whipping cream till stiff peaks. I used non-dairy so it'd last longer outside as I had to travel with it..
13. Double boil water and gelatin till gelatin has dissolved. Allow mixture to cool to room temperature. 13. Add gelatin mixture and mango puree into whipping cream and fold till well combined. 14. In a cake ring, set first layer of chocolate sponge cake in the middle. Spray with some sugar syrup to keep the cake moist. 15. 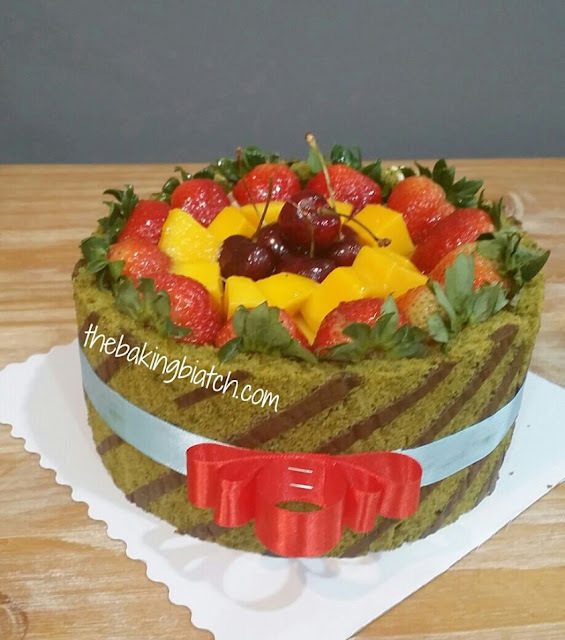 Allow sufficient space along the insides of the cake ring to fit the matcha 'walls'. 16. Adjust the cake ring to fit, avoiding gaps. 17. Scoop 1/2 of the mango mousse onto the chocolate sponge. 18. Top with fresh mango cubes. 19. Add second layer of chocolate sponge. 20. Repeat 17 and 18. 21. Smooth out the mango mousse, avoiding the sides of the 'walls'. 22. 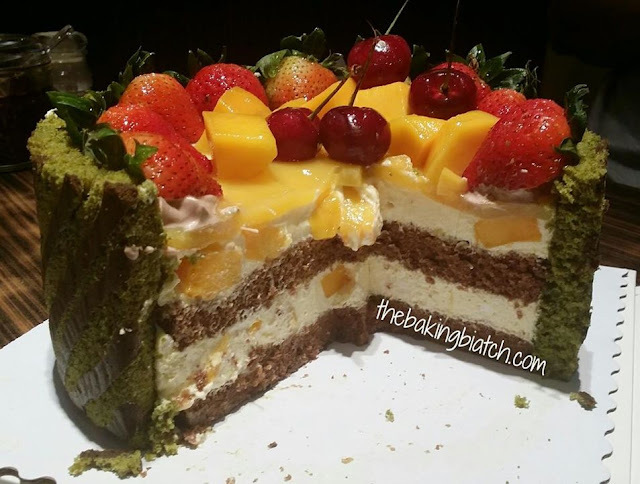 Set cake layers in freezer for 20 - 30 minutes while preparing mango mirror. 23. Double boil mango puree, sugar and gelatin till gelatin dissolves completely. 24. Allow mixture to cool completely. 25. Pour mango mirror mixture onto mango mousse. 26. Set in freezer for 15 minutes. 27. Garnish cake with fresh fruits. 29. Brush some apricot jam/apricot jam mixed with a little water if it's too thick to glaze the fruits. Cake should be kept in the chiller till it's ready to be enjoyed!